It seems that no sooner do we become comfortable with new technology; some start-up company comes along with new advancements. Prysm, a San Jose company, is making waves with its laser phosphor display screens (LPD). 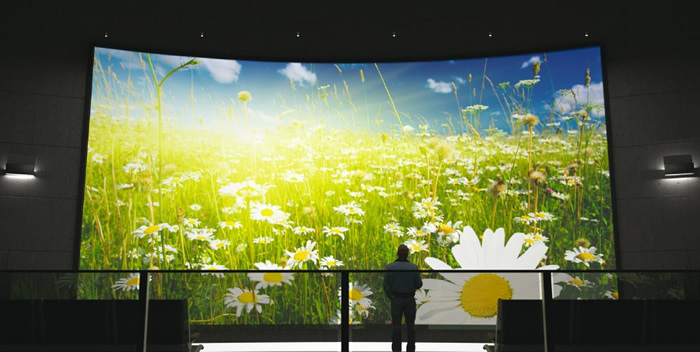 Prysm is taking on the giants of the commercial display market like Barco, Samsung and Sony. LPD is an innovative display technology and large format display platform, which represents the next generation of large format digital displays. When compared to competing technologies, such as LCD, LED, and Projection, LPD technology is more efficient and offers a distinctive combination of features and benefits, such as life-size experiences in any size and shape with exceptional viewing angles. 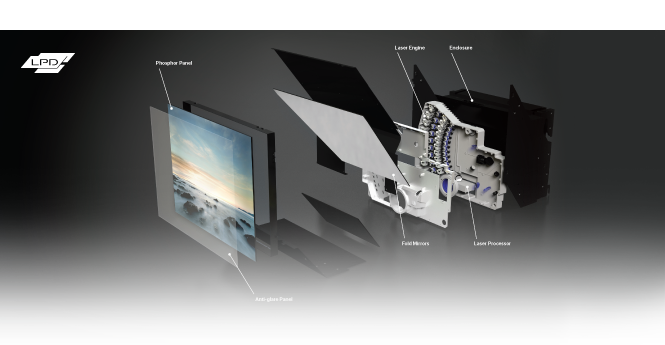 LPD technology can produce large screens with exceptional black levels, 3-D capable resolution, low-power consumption, and a wide 178° viewing angle with completely recyclable components, no mercury, and a 65,000 hour panel life, with no burn-in issues. Tiny patterns of phosphors are layered on the inside surface of the glass, and these emit red, green or blue light when excited by a UV laser to produce bright, HD images. Since the phosphors are extremely close to the surface, no image filtering is needed. Using special coatings or substrates, the display can also be modified to suit specific viewing needs. LPD consists of 3 main parts: the laser engine, the laser processor, and the phosphor panel. Traditional displays operate using a constant light source, which is adjusted to get different colors. Instead of electrons, LPD uses lasers in rapid on-off pulses aimed at phosphors which glow red, green or blue to activate the phosphors that produce different colors on the screen. The lasers scan a surface emissive screen exciting the phosphors to create an image on the surface of the display. This process is extremely environmentally friendly drawing just 30 watts of power per 25” tile, which will reduce the total cost of ownership when compared to competing displays over the life of the product. Similar to Blu-ray players, solid-state laser diodes are mounted behind the screen and point at a bank of tiny, rapidly moving mirrors. The mirrors expose the laser light across the screen to construct the necessary number of image lines and create the picture. The resultant images have no motion, blur or shimmer. The laser beams are continually monitored to present only the light that's required for the image, which saves power and increases the lifespan of the display. Other displays have constant background illumination. LPD reduces the energy load by producing an image for 80% less cost than a plasma large-screen display and 75% for LCD. The displays use low-cost and safe elements to create the image, making them cheaper and more environmentally friendly. The displays are built with existing technology without the need for clean rooms in the manufacture of the screens. This process reduces the expense significantly. 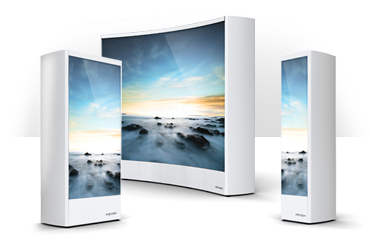 Prysm has 5 ready-to-install display solutions can be used for a mix of environments, such as freestanding products, or they can be built into walls for a permanent exhibit. The company is focusing on very large displays made by combining several screens to create a single over-sized image in retail or other public spaces, such as sports stadiums. LPD can create displays of any size or shape using seamless technology combined with a 178° viewing angle. A room can be designed with a 360° image or wind-up a spiral staircase. Using LPD flexibility, freeform display solutions for video walls and freestanding art-form displays are extremely feasible. The fast response time of 240 Hz and the 1.6 mm dot pitch exceed competing technologies. 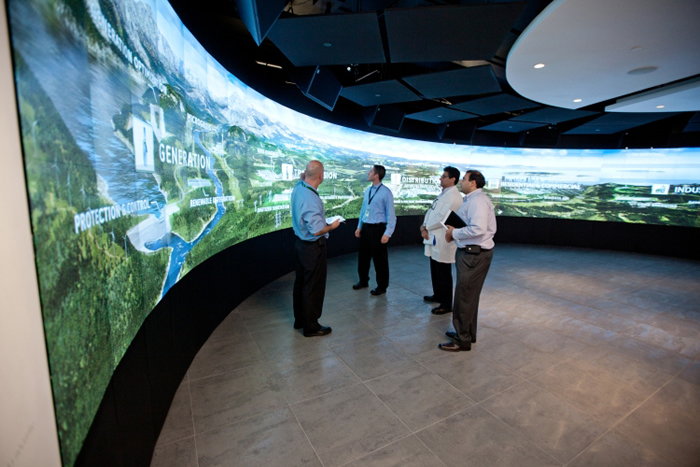 Videoconferencing can now become life-sized, using LPD video walls that allow for more participatory video conferencing with uniformity across the screens and content clarity with no motion blur. IAC and Prysm have unveiled two new video walls in the lobby of the IAC headquarters, located in the Chelsea neighborhood of New York City. IAC is a leading media and Internet company, comprised of more than 150 brands and products. 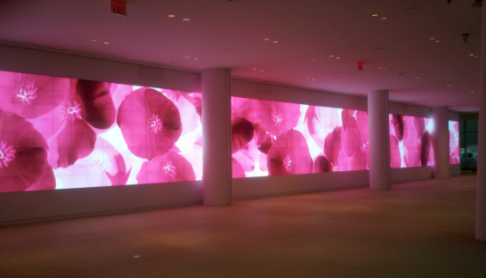 The IAC installation features the world’s largest high-resolution video wall using LPD technology. LPD technology gives the IAC designers the ability to create video content in any shape, size or format. IAC HQ’s video displays consist of two separate walls. The west wall measures nearly 120’ wide by 10’ tall, consisting of over 43 million pixels, and the east wall measures 20’ wide by 10’ tall, displaying 7.3 million pixels. Each wall has a 178° field of view, leading to extraordinary vistas from any angle in the large event space. Time Warner Cable installed a LPD display in the company’s new Staten Island, New York, retail store. The 16.6’ x 6.25’ display generates a distinctive in-store experience for Time Warner Cable by showcasing information and entertainment content from Time Warner Cable and partner networks for their customers to enjoy. The LPD video wall plugs directly into a standard 110V outlet within the store requiring no additional heating, cooling infrastructure or power supply equipment; and the video wall consumes the same amount of energy as a household hairdryer. 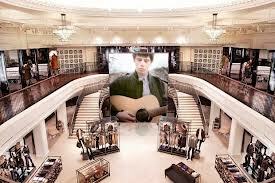 British fashion house Burberry unveiled its first digitally-integrated retail outlet at its newly launched London flagship store. This is the company’s largest store, which covers four floors. The display screen is a 22’ LPD. American Eagle Outfitters reinvented the shopping experience in its retail stores by installing LPDs in its flagship store in New York. 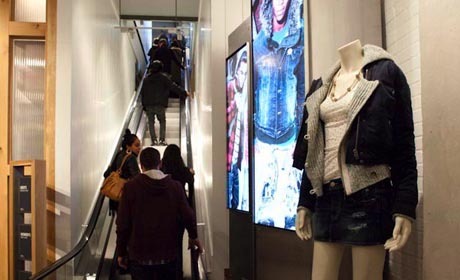 The company installed a series of seven foot tall video pillars; each consisting of four LPDs stacked to form a continuous vertical image, advantageously located near the store’s escalators. The pillars demonstrate life-size, high definition images of models in motion, wearing the company’s latest fashions. LPD displays have no bezels, allowing the image to extend to the edge of the glass, resulting in displays that can be lined up in stacks or rows to form a single image, as large as desired. Prysm’s LPD walls are larger than the largest LCD screens, far brighter than projection screens, and far more detailed than LED displays. Compared to other digital technologies, LPD has the lowest total cost of ownership and offers highly competitive features, benefits and usage possibilities. As for the future, expect to see LPD HD televisions that are competitive to LCD and plasma.